This is an easy paper footprint craft to make to teach preschoolers about the first Thanksgiving with Pilgrims and Native Americans. Enjoy! Footprint headband hat craft to make. Oh What fun! I taught a Seasonal Celebrations class with a Thanksgiving theme. We traced our feet onto colored construction paper. This is a great tactile activity for toddlers and preschoolers, as well as, a fun way to learn colors. Kids love to use scissors! Half the fun was cutting the paper into pieces while the Mommies and Grandmas cut out the feet. 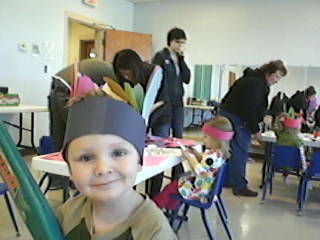 Thanksgiving Crafts: Footprint Headband Native American Hat Craft for Kids. 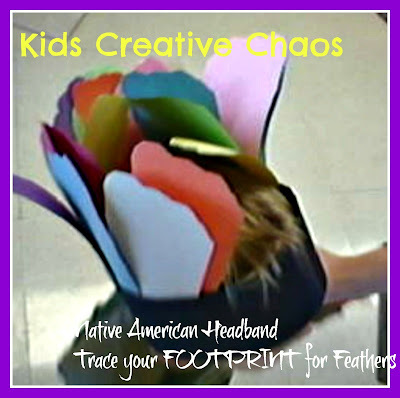 Make a headband from small strips of paper, attach it with staples or tape, then hand the kiddos a glue stick and let them get busy sticking those feathered feet onto the band. It's a nifty twist on the traditional, Native American headdress. We read, "Twas the Night Before Thanksgiving" and Played Broomstick Toss. 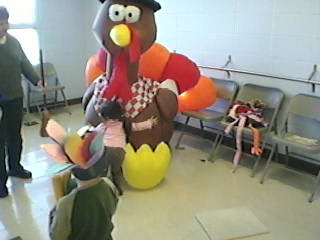 We hugged the turkey dubbed, Princess Emma, goodbye.